Which one has the most caffeine? A tall (12 fl oz, or 355 ml) brewed coffee, a tall latte with one shot of espresso (both at Starbucks), and a can (12 fl oz) classic Coca Cola? Your instant answer maybe the latte (espresso), but the correct answer is the brewed coffee. According to Starbucks Nutrition By the Cup (PDF), 12 fl oz coffee has 240 mg caffeine, one shot espresso (1 fl oz) has 75 mg caffeine. As to Coke, I saw it says “caffeine content: 34mg per 12 fl oz”. I don’t know what is the appropriate amount of caffeine a person could consume daily. My guess is one small cup a day should be ok for most people. I think it also depends on person’s health condition (weight, height, habbit of drinking). But just like many other things in life, moderation is the key. A cup of regular coffee will get one refreshed in the morning (it has caffeine equivalent to 7 cups of Coke). But when the initial effect of coffee goes away in a few hours, he/she will resort to another coffee. And so on. I think we can be more easily get caffeinated that way. On the other hand, while a coke will give a person a little stimulus, without knocking out him/her. And a person can drink 3 or 4 coke a day (assume he/she exercise to burn the calories), while still consuming half the caffeine of a small coffee (tall is Starbucks fancy word for small 12 fl oz coffee). 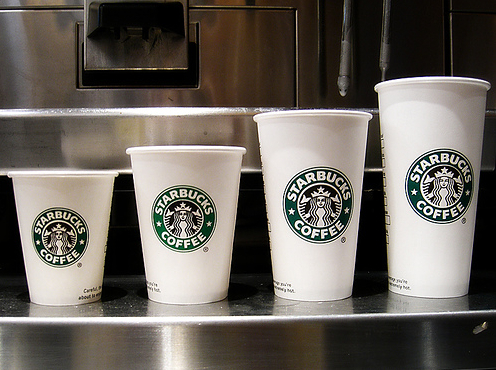 One tip: I understand Starbucks is not just a coffee house, it is also social place for many people. If you don’t want to have caffeine but like the taste coffee, order the decaf (that’s di yin ca fei ä½Žå› å’–å•¡ in China). Starbucks does offer a variety of other drinks (including tea) as well. In the next post, I will discuss the relative stock performance of Coca Cola and Starbucks.